If you think that your eyes are playing tricks on you when you visit Cameron Falls in Alberta’s Waterton Lakes National Park, they aren’t. The falls really are changing color. It’s a phenomenon that happens after a heavy rainfall hits the region. 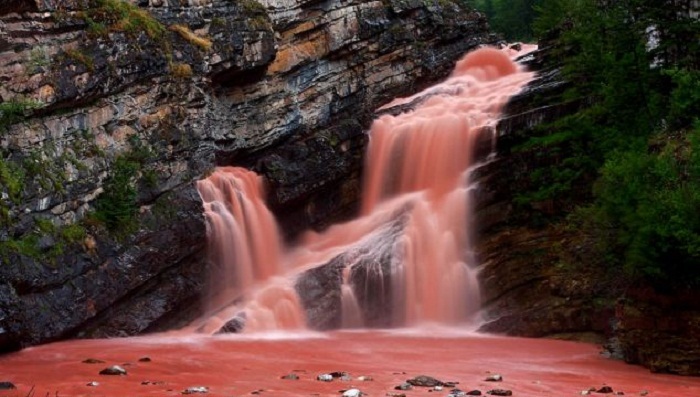 Sediment called agrolite is released into the water and makes the river look pink or red when the light hits it. That water rushes toward Cameron Falls and, voila, visitors are on the receiving end of some stunning (and really instagram-worthy) photo ops. If you are looking to time your visit to coincide with a glimpse of the Technicolor falls, the spring and summer are the best times to go. However, it’s a rare phenomenon; Your trip needs to be almost perfectly planned to witness the color transformation. Cameron Falls usually has crystal-clear water. Rochelle Coffey was lucky enough to be visiting after a heavy rainfall and saw Cameron Creek turn red. She and her husband raced to the falls and were able to catch a glimpse of the pink water as it rushed over Cameron Falls. “It took a couple hours for the sediment to reach the falls, and when the falls did finally turn red, it was a lot slower a process than we had anticipated,” Coffey told the Daily Mail. If you miss out on the pink falls, there are a number of other things to do in the area. Visiting the falls when they are "normal" color is a worthy endeavor, and the quiet, uncrowded national park in the southwestern part of the province teems with wildlife, stunning scenery, rolling hills and more.